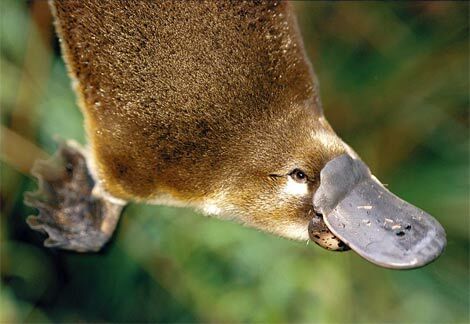 The platypus is an evolutionary puzzle. When a Platypus specimen was first sent to England, the local scientists concluded that some smart-arsed Australian had tried to play a joke on them by sewing the feet and bill of a duck onto the body of a rat. The peculiar animal in front of them just looked too bizarre to be taken seriously. But even more unacceptable facts awaits them-- the animal lays eggs. A mammal that is! 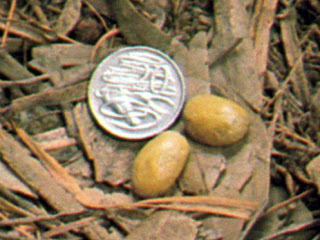 Together with the four species of echidna, it is one of the five extant species of monotremes, the only mammals that lay eggs instead of giving birth to live young. The eggs are leathery and small, similar to that of reptiles. A female platypus suckles its young via two round patches of skin midway along her belly. 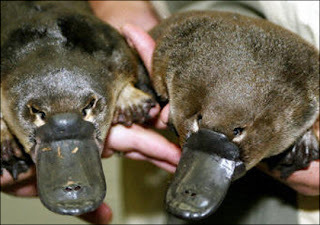 While both male and female Platypuses are born with ankle spurs, only the male has spurs which produce a cocktail of venom, three of which are unique to the Platypus. The venom is not lethal enough to kill a human, however, but is extremely excruciating that it could incapacitate one. We human have five senses. The platypus has an additional one--electroreception. 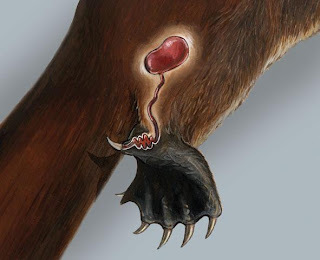 They locate their prey in part by detecting electric fields generated by muscular contractions. 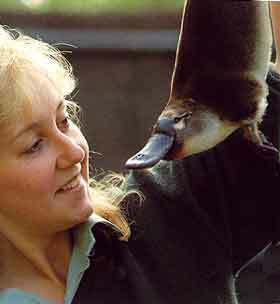 The Platypus closes its eyes, ears, and nose each time it dives, thus it doesn't feed by sight nor by smell. Rather, when it digs in the bottom of streams with its bill, its electroreceptors detect tiny electrical currents generated by muscular contractions of its prey, so enabling it to distinguish between animate and inanimate objects, which continuously stimulate its mechanoreceptors. This animal is not in immediate threat of extinction. But human activities such as irrigation and pollution could still affect its population. You know according to the Disney Channel TV show, Phineas and Ferb, platypuses supposedly don't do much. What Happens if You(women) Leave Afghanistan.